Someone has leaked very important documents. We couldn't find any proof without one PCAP file. But this file was damaged. The password of disclosure document is very weakness and based on Time, can be found easily. 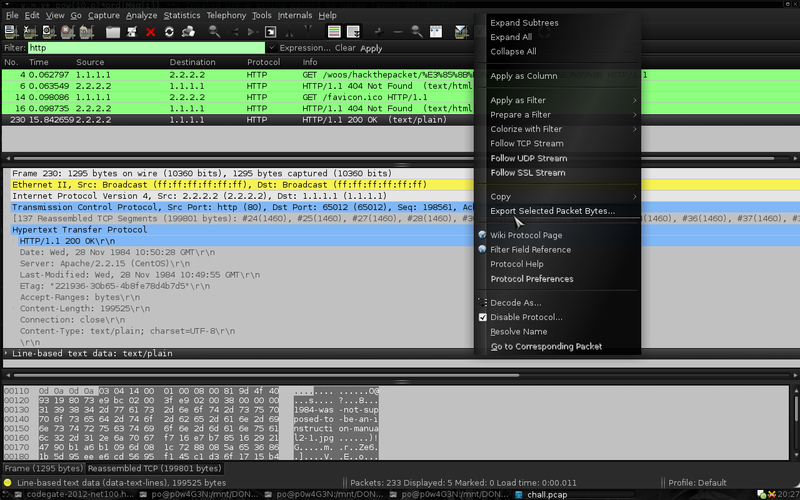 Keywords : pcap, wireshark, zip. So, we need to find Crypto and Key somewhere in the attached file to recover the flag. The file format is not known to unix 'file' utility, but we can guess is it a damaged pcap. 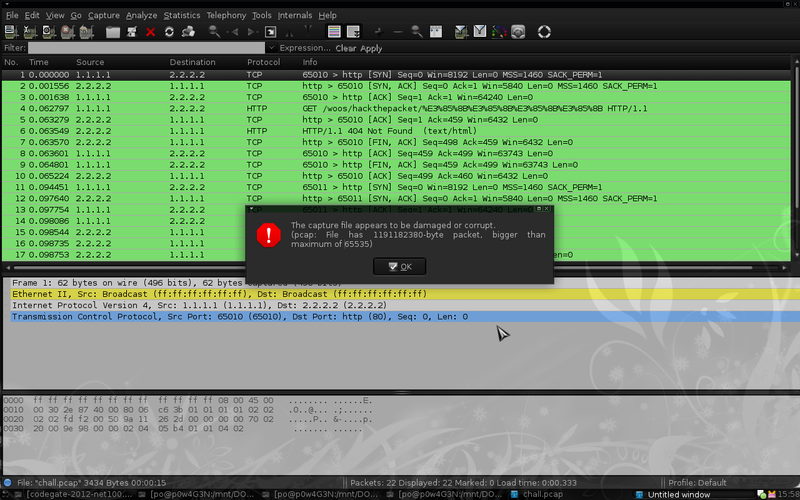 No luck, wireshark is not able to open it either. It's time to pull out an hexadecimal viewer. 0000010: ffff ffff ffff ffff ffff ffff 0800 4500  ..............E.
0000030: 0202 fdf2 0050 9a11 262d 0000 0000 7002  .....P..&-....p.
Obviously the file is still damaged and wireshark only displays the very beginning of it. If we analyse the file more closely, it appears that one packet header and some data has been removed : See here for packet header specification. 0000  ff ff ff ff ff ff ff ff  ff ff ff ff 08 00 45 00   ........ ......E.
0020  01 01 00 50 fd f4 bc 3e  ec 5f e5 49 9b ca 70 12   ...P...> ._.I..p.
0000d44: 16d0 3e42 0000 0204 05b4 0101 cabc 3eec  ..>B..........>. 0000dc4: 6b74 6865 7061 636b 6574 2e63 6f6d 0d0a  kthepacket.com..
0000d54: 6050 18fa f062 2c00 00                   `P...b,..
0000f30: 713d 302e 330d 0a0d 0af4 8d3b 4f30 a200  q=0.3......;O0..
[0xf39, 0xf48] : Pcap packet header. At 0xf49 : Beginning of Ethernet frame, 0xffff... being the broadcast MAC address. We need to get rid of [0xd52, 0xf38] which is invalid. From now on, chall.pcap opens nicely is wireshark. We notice two things. Firstly, the server date is weird in the last HTTP OK response, but we remember that the password is based on time. We now have Key = 0x19841128. Secondly, a huge amount of data is transfered. At first glance it is a large file, probably an archive since we can see the name of 3 files inside it : 1984-was-not-supposed-to-be-an-instruction-manual2-1.jpg, George_Orwell.jpg, et key !! We definitely need to extract this file. As suggested by a teammate, the multiple 'PK' strings in the file make us thing of ZIP file format. Basically, a ZIP file is constituted of one header beginning with 0x04034b50, where 0x50 and 0x4b translate to 'PK' into ascii, and one footer beginning with 0x06054b50. file.zip.zip, and cannot find file.zip.ZIP, period. But again, the zip file is corrupted somehow. At that time, we tried to extract all possible chunks beginning with 'PK', but they were all corrupted. I eventually realized that the beginning of the file is not so different from a valid ZIP header, because it contains \x03\x04, except that the two first bytes \x50\x4b are missing. 0030af0: cfeb cc01 8d0c b530 cfeb cc01 504b 0102  .......0....PK..
0030b20: 0000 2000 0000 bd09 0300 6b65 790a 0020  .. .......key..
0030b50: 0150 5b05 0600 0000 0003 0003 0042 0100  .P[..........B..
We notice that the End-of-central-directory signature (normally 0x06054b50) has been replaced by 0x06055b50 (at offset 0x30b51). We replace the wrong byte with an hexadecimal editor such as hexedit. Then we can unzip the file using the date 19841128 as password. We have the flag, and 100pts !